CASP silos are adequate for the storage of the most varied grain types, maintaining their quality and improving the profitability of your unit. Manufactured with galvanized steel, with advanced design and project, they resist to the efforts of wind and offer resistance and greater durability. Available in the diameters of 5.5 meters to 33.0 meters, with storage capacity from 95 to 15,000 tons. The walls of the CASP silos are corrugated and built with galvanized plates ZAR 400, ensuring resistance and greater durability. The silo body is structured with resistant reinforcements, adequately fixed to the silo body and dimensioned within the effective standards. CASP silos are fixed to the concrete base, through anchors, made with high-resistance steel and base shoes made of galvanized steel, ensuring solid fixation. For fixation between plates, bichromatized screws of high mechanical resistance and to the weather are used, with neoprene nuts and washers, thus ensuring the sealing of the silo. Roof with plates in a single inclined cast, ensures to the CASP silos better structural adequacy and sealing against moisture. They are designed to resist to the sustainment of thermometry cables, as well as for the central support of the footbridges on top of the silo. CASP silos are provided with breathers, carefully designed to prevent the accumulation of impurities and to prevent the entry of rainwater. They have protection screens to prevent the entry of birds and other animals. 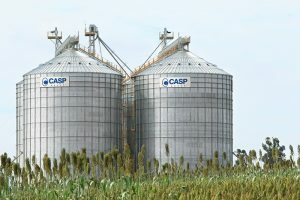 CASP silos are provided with round inspection ports, both on the roof and on the silo wall, as well as a rectangular port on the silo wall (optional item). Access to those ports is made in a safe manner, with galvanized ladders and platforms incorporated to the silo walls, according to safety standard NR12. Such ladders are installed on the silo wall, on the roof and on the internal part thereof. The silo wall ladder may be caracole, facilitating the access thereof. The flushing of the stored product may be gravitational, with the incorporation of a side flushing system on the silo walls, as well as trough lower floodgates, through a register and ratchet system. The sweeping screw, which provides the possibility of total silo emptying, also belongs to the final flushing system of the silos. The CASP silo floor may be totally perforated or with chutes of galvanized perforated plates, with a design and holes for the various types of grains, ensuring excellent airflow to the product stored, through its fans, for good grain quality. The grain spreader installed is used to distribute in a homogeneous manner the entry of grains and impurities in the silo. This homogenization system renders the aeration system more effective, ensuring the best airflow among the grains. CASP provides a complete line of fans for aeration of their silos, providing the stored product quality assurance. Fans are manufactured with high resistance steel, balanced to provide better performance, with a low noise level and energy economy, with the option with high performance engines. There is also one portable computerized thermometry system, with sensors ensuring accuracy in readings, with easy operation on data collection, facilitating the grain mass temperature management, according to the specific weight of the stored products.